1. When Will The Contest Winner Be Announced? The contest winner will be announced by February 21, 2014. 2. What Is The Prize That Will Be Awarded? The winner of the Real Family Trips Contest will receive an iPad Air. 3. Who Will Select The Contest Winner? The winner of the Real Family Trips Contest will be chosen by a panel of judges chosen by the owner of the website www.realfamilytrips.com, including some or all of the following: up to 3 well traveled teens, 1 well traveled tween, and 2 well traveled adults. 4. Will You Notify Me If I Do Not Win? No, sorry. Only the winner of the contest will be notified. 5. How Many Times Can I Enter The Contest? There is a limit of 25 entries per email address. Each entry must be from a separate day of your trip. For example, if you went to Paris for 3 days, each day of your 4 day trip to Paris can count as a separate entry, as long as each day had at least 2 stops. Feel free to dig up some itineraries from the past few years of trips to try to enter as many times as you can (up to 25 entries) to increase your chances of winning! 7. If I Reside Outside Of The USA Can I Still Enter The Real Family Trips Contest? No, very sorry about that. For now, we can only accept US residents entries to the Contest. But we would still love to hear from you- feel free to share your itineraries here so that other families can benefit. But unfortunately those submissions won’t be entries for the Contest. 8. Can I Enter The Real Family Trips Sweepstakes If I Am 17 Years Old (or younger)? No, sorry about that. To be eligible for the Real Family Trips Contest you must be a minimum of 18 years old at the time you submit your entry. Entrants who are younger than 18 years old will not be considered for the Contest prize, and entries from the individual will be considered invalid. 9. Do I Retain Any Rights to My Entry Materials? When you submit an itinerary and related photos you retain the rights to this material, but you are granting Real Family Trips a right and license to use, display, reproduce, and create derivative works with these materials that is non exclusive, free of royalties, perpetual, and world wide. This license may be used at our sole discretion, and includes use of these materials for all purposes, including any educational, publicity, promotional, exhibition, or other purposes that we deem appropriate. 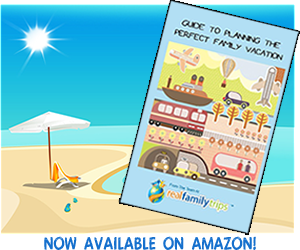 Real Family Trips will not be required to pay any consideration or to gain approval from the individual who submitted the entry in order to use these materials. 10. Where Do I Send Any Questions, Comments, Or Feedback? If you have any questions, comments, or feedback about the Real Family Trips Sweepstakes then please send use the Contact Us form on the Real Family Trips website. We would love to hear from you!